Vaughan Redford scored a hat-trick at Handsworth on Tuesday night. Vaughan Redford hit a first half hat-trick but it wasn’t enough to earn Liversedge victory in a thrilling 3-3 draw at Handsworth Parramore on Tuesday night. 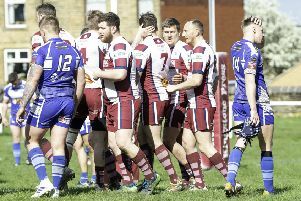 Liversedge were in complete control against one of the favourites to win the Northern Counties East League Premier Division title before the home side fought back. Steven Wailes beat the full-back and crossed for Redford to side foot home after 18 minutes and Joe Walton almost doubled the advantage but his header rebounded off the crossbar. Walton produced a superb counter attack and crossed for Redford to tap home. Liversedge were playing some terrific football and a lovely move ended when Redford was played into the penalty area to complete his hat-trick. Handsworth pulled a goal back before half-time when Harrison played a neat one-two and crossed for Jon Froggatt to slide the ball home. Blakey, son of former Yorkshire and England cricketer Richard, almost extended Liversedge’s lead but goalkeeper Joe Green was alert to make a good save from his fierce drive. Handsworth had appeals for a penalty turned away before grabbing a second in the 65th minute when a Wells crossed was met on the half volley by Alex Rippon to fire beyond the goalkeeper. Handsworth then drew level 15 minutes from time when Smyth struck a stunning 25-yard drive into the far corner. Liversedge almost won it in the final minute when a forward slipped the ball beyond the goalkeeper but Griffiths got back to hack it off the line as honours ended all square. The draw leaves Liversedge fifth in the Premier Division table with seven points from their opening four matches, which included a 2-1 away win at Staveley Miners Welfare last Saturday. Sedge took a 32nd minute lead when Cody Cromack found Redford in the area and the striker created himself space to rifle home. Staveley were behind for just two minutes as Kieran Watson equalised. Staveley captain Ricky Hanson was shown a straight red card for deliberate handball inside the area and Brandon Kane stepped up to convert the penalty. Sedge worked hard in the second half and frequently caught Staveley on the break but were unable to add a third goals, although their solid start to the season continued. Liversedge entertain Rainworth MW on Saturday before travelling to Maltby Main next Wednesday as they look to build momentum and keep pressure on the early leaders.